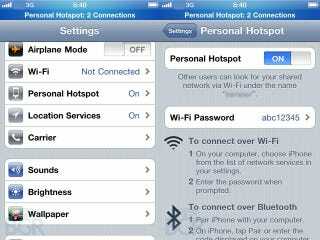 According to BGR—who's got a good track record with these things—iOS 4.3 will bring personal hotspot capabilities to all iPhones regardless of carrier. We already know Verizon's on board. What say you, AT&T? The feature will almost certainly require carrier support, which means that AT&T could deny its users hotspotability. Otherwise, the feature is as we heard Verizon describe it: you'll be able to connect up to five devices over Wi-Fi to the phone's 3G data connection. As for when all this will happen, BGR's sources say that iOS 4.3 will hit technical acceptance in March. Just a couple months before iPhone 5, hrmmmm?